The European Commission organised the first ever EU Sport Forum in Biarritz on 26 and 27 November. Key sport stakeholders discussed during 2 days the implementation of the 2007 White Paper on Sport, the financing of grassroots sport and the specificity of sport. The Forum took place in close connection with the informal meeting of EU Sport Ministers under the French EU Presidency on 27 and 28 November. 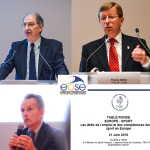 About 200 leading representatives from European sport organisations, national sport confederations, National Olympic Committees and international sport stakeholders were invited to attend and participated to the event. The first session focused on progress made in implementing the White Paper on Sport in specific areas such as EU social dialogue and Education in sport. As mentioned through the last bulletin, the President of EOSE Mr Stephen Studd was invited to make a presentation during that first session on “Education and Sport”. This great opportunity gave EOSE the possibility to present the overall concept of the Alliance, the key Education and Training issues and challenges for the Sport and Active Leisure sector in Europe, EQF and ECVET, and also to deliver an overview of our scopes, methodologies developed and practical sub-sectoral works undertaken through EU projects. 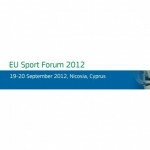 The Commission then organised two panel debates: the first one dedicated to the financing of grassroots sport and the second one covered the specificity of sport. After an introduction by the Commission, organisations which have made the main concrete contributions to the debate on this concept had the possibility to present their opinions. An active exchange of views with representatives from a variety of sport and sport-related organisations during these two days contributed to ensuring the success of the event and has helped the Commission to identify future priorities for EU-level debates on sport.